Vodafone UK is the third largest mobile telecommunications network in the United Kingdom with 17.5 million subscribers. This means that there is a good chance when you buy a second-hand smartphone from the UK, it will be locked to Vodafone UK. The only way to be 100% sure about a refurbished Vodafone UK cell phone is with the Vodafone UK IMEI Check. 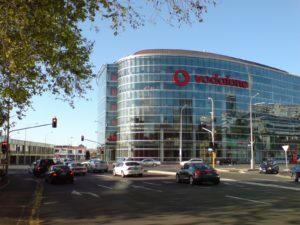 Despite Vodafone UK‘s third place in Great Britain (after EE and O2), Vodafone Group remains the world’s second-largest mobile phone company. Why get a Vodafone UK Full IMEI Check? One way or another, what you don’t know is that a used iPhone (or any other Android Smartphone) can be SIM – Locked, Blacklisted, Under Contract or Under Warranty. iPhones are even trickier with the iCloud Activation Lock Status. While you think you are getting a good deal, you are at risk of buying a Vodafone UK locked mobile and this is the least of your worries. The other factors can render your new iPhone useless and in some cases beyond repair options. But don’t worry because this is why Vodafone UK Full IMEI Check service exists. What is the Vodafone UK Full IMEI Check tool? 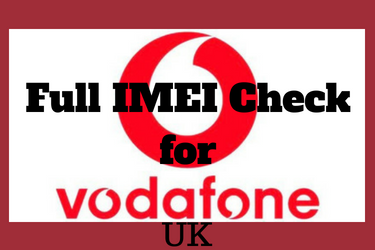 Vodafone UK IMEI Checker is, in fact, the Full IMEI Check Service. This service knows no Carrier or Smartphone Brand boundaries and it will immediately show you all the issues a mobile might have using only the IMEI number of the device. So let’s take each case separately and see why an IMEI Check is crucial before buying a second – hand mobile. Almost always a cell phone is locked to the Carrier in which the mobile was initially activated with. This means that the smartphone can use SIM cards from that Network and that Network only. In this case, if you are not a Vodafone customer, you won’t be able to use your Carrier’s SIMcard unless you Network Unlock the mobile you bought. In this example, you can see that this iPhone is locked by Vodafone UK (and on top of that is iCloud Locked). In other words, the iPhone you found at a really low price (or not) on eBay is toxic. Of course, there is always a way to Carrier unlock it. it will become immediately blacklisted. This means that you won’t be able to use it unless it’s restored to a CLEAN Status. The Vodafone UK Blacklist IMEI Check will reveal the truth about the Blacklist Status of the refurbished mobile you are interested in. In this example, the iPhone you are looking at is blacklisted by Vodafone UK. On the other hand, this Samsung Galaxy A5 is totally CLEAN and ready to go! As long as a used smartphone is protected by Warranty or remains under contract with the previous owner, you are in danger of getting your mobile blacklisted in case of unpaid bills or Insurance Claims. And you really don’t want this to happen. Last but not least, refurbished iPhones are even more dangerous because of the Find My iPhone Feature. If iCloud Activation Lock is enabled then you won’t be able to use the iPhone completely unless the original owner deactivates iCloud Lock. Can I network unlock a Vodafone UK locked smartphone? Vodafone UK has a nice online form in order to SIM Unlock your Vodafone cell phone by requesting a Network Unlock Code (NUC). This is a step by step Carrier Unlocking guide for any circumstance and you will find no problems in using it. How much does it cost to unlock a Vodafone UK phone? Nothing! It’s completely free as long as you fulfill Vodafone UK’s Network Unlocking prerequisites. How long will it take for my smartphone to get unlocked by Vodafone UK? The SIM Unlocking procedure through NUC can take 48 hours to 10 days depending on your smartphone’s manufacturer. There are ways to network unlock any device but Blacklist Status, iCloud Activation Lock, In – Contract Status and Warranty Status are hard to deal with and only a Vodafone Full IMEI Check Service can reveal all secondhand device’s issues before it’s too late. Leave your comment below if you are still uncertain about the importance of IMEI Check Tool.